NEB 10-beta chemically competent cells are more efficiently transformed with large plasmids than NEB 5-alpha cells. The difference in TE between the two cell lines increases with the size of the plasmid being transformed. Effect of heat shock time on NEB 10-beta competent E. coli transformation efficiency: 50 μl of competent cells were transformed with 100 pg of pUC19 control DNA following the provided High Efficiency Transformation Protocol except heat shock time varied from 0 to 80 seconds. 50 μl of NEB 10-beta competent E. coli was transformed with 100 pg of pUC19 control DNA following the provided High Efficiency Transformation Protocol with the exception of varying the outgrowth medium. 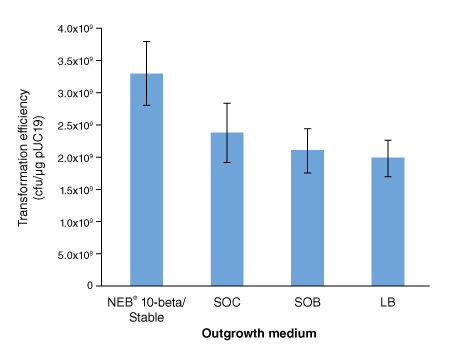 NEB 10-beta/Stable Outgrowth Medium delivers the highest transformation efficiency. What are the strain properties (C3019)? What is the difference between NEB #C3019H and NEB #C3019I? What is the shelf life for this strain (NEB #C3019H and NEB #C3019I)? Does plasmid size affect transformation efficiency (C3019)? How should I calculate the transformation efficiency (C3019)? What is the optimal heat shock time for this strain (NEB #C3019H and NEB #C3019I)? How long should I incubate cells on ice after DNA has been added (NEB #C3019H and NEB #C3019I)? ONESHOT® and MAX EFFICIENCY® are registered trademarks of Thermo Fisher Scientific. DH10B™ is a trademarks of Thermo Fisher Scientific.